Objectives: Antibody-mediated rejection in transplant recipients with preexisting donor-specific antibodies is a challenging clinical situation. However, we lack suitable animal models to study this scenario. 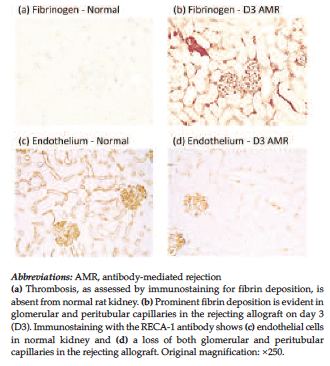 The aim of this study was to develop an animal model of acute antibody-mediated rejection of renal allografts in sensitized recipients. Materials and Methods: We used major histocom-patibility complex class I and II incompatible rat strains (Dark Agouti RT1av1 and Lewis RT1l), which develop aggressive rejection. Recipient Lewis rats were immunized with donor strain spleen cells 5 days before surgery to induce donor-specific antibodies. Rats underwent bilateral nephrectomy and orthotopic transplant of the donor kidney. To minimize T-cell-mediated rejection while allowing the development of donor-specific antibodies, recipient animals were given tacrolimus starting the day before surgery. Results: Hyperacute rejection was not seen, but acute graft dysfunction was evident on day 1 with a rapid deterioration of graft function by day 3. Histologic damage featured glomerulopathy, capillaritis, capillary thrombosis, and acute tubular injury. 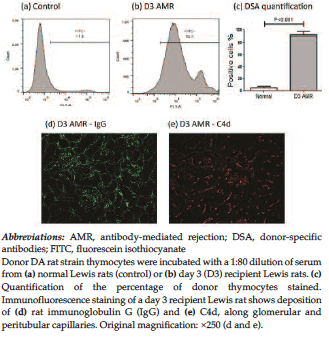 Recipients exhibited high serum levels of donor-specific antibodies and deposition of immunoglobulin G and C4d on graft endothelium. Immunostaining showed substantial endothelial damage, fibrin deposition in glomerular and peritubular capillaries, and infiltrates of macrophages, neutrophils, and natural killer cells. T-cell activation was efficiently suppressed by tacrolimus. Conclusions: We have developed a clinically relevant model of acute antibody-mediated rejection in recipients with preexisting donor-specific antibodies, which is suitable for testing novel therapies. Rejection remains the main cause of graft loss after renal transplant. 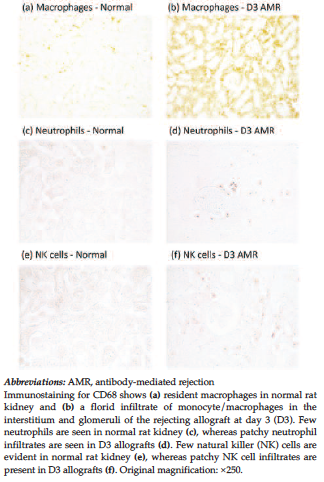 Cellular rejection is now well understood and generally managed effectively by current immunosuppressive regimens, leaving antibody-mediated rejection (AMR) as the major issue facing clinicians.1 Acute AMR is a significant cause of acute graft loss, whereas chronic AMR is a major cause of death-censored graft loss.2,3 The mechanisms underlying AMR are not fully understood, and current therapies for AMR are suboptimal. Indeed, potential transplant opportunities are foregone due to the presence of donor-specific antibodies (DSAs) in highly sensitized patients because of the risk of AMR. As a result, such patients face extended wait times on the transplant wait list. To date, relatively few models of AMR exist in kidney transplantation, and these have largely focused on inducing rejection by passive transfer of DSA once the graft is functioning normally. To enable investigation of acute AMR in sensitized patients, we aimed to create a more clinically relevant model in which renal allografts are performed in recipient animals with high levels of preexisting DSAs and in which the confounding effects of cellular rejection are suppressed. This study was undertaken in the rat using kidney transplant across major histocom-patibility complex class I and II barriers. Mouse antirat monoclonal antibodies used in this study included ED1 (CD68), RECA-1 (endothelium), CD161 (NK cells), R73 (rat αβ T-cell receptor) (Serotec, Oxford, UK), as well as RP1 (neutrophils) (Becton Dickinson, San Diego, CA, USA). Other antibodies included rabbit antifibrinogen (Santa Cruz Biotechnology, Santa Cruz, CA, USA), fluorescein isothiocyanate-conjugated goat polyclonal antibodies against rat immunoglobulin G; (IgG; Sigma Aldrich, St. Louis, MO, USA), rabbit anti-C4d (Hycult Biotech, Plymouth Meeting, PA, USA), and Alexa594 conjugated donkey antirabbit IgG (Invitrogen, Carlsbad, CA, USA). Biotinylated secondary antibodies were goat antimouse IgG (Zymed, San Francisco, CA, USA) and goat antirabbit IgG (Invitrogen), which were detected using a Vectastain ABC kit (Vector Laboratories, Burlingame, CA, USA). Other secondary antibodies included horseradish peroxidase-conjugated goat antirabbit IgG, goat antimouse IgG, and mouse peroxidase-conjugated antiperoxidase complexes (all from Dako, Glostrup, Denmark). Tacrolimus was obtained in powder form from Selleck Chemicals (Houston, TX, USA). Male Dark Agouti (DA/Arc, RT1av1) and Lewis (Lew/Arc RT1l) rats were obtained from the Animal Resources Centre (Perth, WA, Australia). The animal studies were approved by the Monash Medical Centre Animal Experimentation Ethics Committee. The spleen was retrieved after killing a donor DA rat, teased apart, and passed through a cell strainer. Red blood cells were removed by ammonium chloride lysis, and the spleen cells were washed and counted. Recipient Lewis rats were immunized by an intraperitoneal injection of 1 × 108 spleen cells in phosphate-buffered saline 5 days before transplant. Rat kidney transplant surgery was performed as previously described.5-7 The donor rat was anes-thetized with ketamine/xylazine, and the left kidney was retrieved and perfused with ice-cold Ross solution via the renal artery and stored in the ice-cold solution while the recipient was prepared. The recipient rat was anesthetized, and then the left kidney was removed and replaced orthotopically with the donor kidney. The recipient and donor ureters were attached using a polyethene stent after revascularization of the kidney. The recipient right kidney was then removed. Before closure, the renal allografts were visualized to ensure reperfusion and lack of hyperacute rejection. The animals were injected with bupivacaine analgesia intraperitoneally before abdominal closure and again the following morning. The day of surgery was defined as day 0. A blood sample was collected on day 1 to assess early graft function. The right kidney from the donor rat was used as normal control. Serum creatinine levels were measured by the Department of Biochemistry, Monash Medical Centre. The T-cell response was suppressed by daily subcutaneous injection of Lewis recipient rats with tacrolimus (1 mg/kg in saline) beginning on day -1 and continuing until animals were killed. Donor strain DA thymocytes were incubated with 100-μL recipient serum samples diluted (1:80) in phosphate-buffered saline with 2% fetal calf serum and 1% bovine serum albumin for 60 minutes at room temperature. After 3 washes, cells were labeled with fluorescein isothiocyanate-conjugated mouse antirat IgG, washed, and analyzed on a MoFlo flow cytometer (Beckman Coulter, NSW, Australia). Controls included serum from control Lewis rats (no experimentation) and use of the secondary antibody alone. Sections (2 μm) of formalin-fixed kidney tissue were stained using periodic acid-Schiff reagent with hematoxylin. Immunoperoxidase staining for macrophages and fibrinogen was performed on 4-μm formalin-fixed tissue sections using microwave-based antigen retrieval and an ABC amplification system as previously described.8 Immunoperoxidase staining for T cells, neutrophils, NK cells, and endothelium was performed on 5-μm cryostat sections of 2% paraformaldehyde-fixed tissue using the peroxidase-conjugated antiperoxidase amplifi-cation system.5,6 Detection of rat IgG and C4d was performed by immunofluorescence staining on cryostat sections of snap-frozen tissue. RNA was extracted from frozen kidney samples with the RiboPure RNA isolation kit (Ambion, Austin, TX, USA) and reverse transcribed using random hexamer primers (Superscript II, Invitrogen). Real-time reverse transcriptase-polymerase chain reaction was performed on a StepOne machine (Applied Biosystems, Scoresby, Victoria, Australia) with thermal cycling conditions of 37°C for 10 minutes and 95°C for 5 minutes, which was followed by 40 cycles of 95°C for 15 seconds and 60°C for 20 seconds. Primers and probes for CD3ε and interleukin 2 (IL-2) were purchased from Applied Biosystems or used as previously described.9 The relative amount of mRNA was calculated using the comparative Ct method. All amplicons were normalized against the 18S RNA internal control (Applied Biosystems). The model that we developed is shown schematically in Figure 1. To induce DSA, recipient Lewis rats were immunized with 1 × 108 DA spleen cells by intraper-itoneal injection 5 days before transplant (termed day -5). Recipients were treated with tacrolimus to suppress T-cell activation beginning on day -1. This was designed to allow T-cell help for the production of DSA and then to suppress T-cell-mediated rejection. Recipient rats then underwent bilateral nephrectomy and transplant with a DA strain kidney (day 0) and were killed 3 days later. An important aspect of this model was the lack of hyperacute rejection. Transplanted kidneys appeared of a good color macroscopically upon reperfusion. 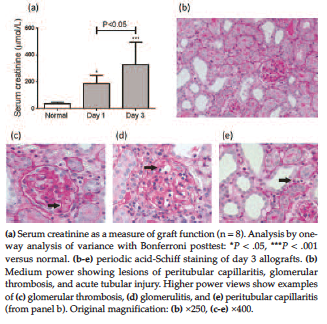 Recipient rats showed acute graft dysfunction at day 1 with serum creatinine levels raised 5-fold over that in normal rats, and graft function further declined at day 3 (Figure 2a). On day 3, grafts exhibited the histologic lesions consistent with acute AMR: peritubular capillaritis, glomerulitis, microthrombosis, and acute tubular injury (Figure 2, b-e). Graft-dependent studies were not attempted beyond day 3 since pilot studies in recipients retaining 1 native kidney found that allografts were severely damaged with areas of infarction and massive leukocytic infiltration on days 5 and 7 (data not shown). In addition, pilot studies found that a 10-day period of sensitization with spleen cells caused severe rejection in some animals on day 3 (data not shown), leading us to use the 5-day sensitization period. High serum levels of DSA in tacrolimus-treated recipient Lewis rats on day 3 posttransplant was confirmed by flow cytometry using DA donor strain thymocytes (Figure 3, a-c). Immunofluorescence staining showed deposition of IgG in glomerular capillaries and along the walls of peritubular capillaries and larger blood vessels (Figure 3d). In addition, deposition of C4d was evident in glomerular and peritubular capillaries (Figure 3e). Monocytes/macrophages were by far the dominant infiltrating leukocyte population. Compared with the resident macrophage population, there was a florid infiltrate of CD68+ macrophages throughout the interstitium and within glomeruli (Figure 4, a and b). A patchy interstitial infiltrate of neutrophils and NK cells was also evident (Figure 4, c-f). Fibrin deposition was prominent in glomerular and peritubular capillaries (Figure 5, a and b). In addition, a loss of RECA-1 staining of glomerular and peritubular capillaries was seen in a patchy distribution, indicating significant endothelial damage (Figure 5, c and d). An important aspect of the model is the use of tacrolimus to suppress T-cell activation. 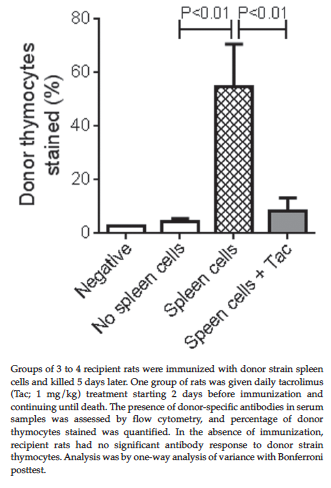 In pilot studies, we confirmed that a significant DSA response occurs within 5 days of a recipient rat being immunized with donor spleen cells and that once-daily 1 mg/kg tacrolimus, started 2 days before donor spleen cell immunization, prevented the DSA response, presumably through inhibition of T-cell help (Figure 6). In addition, we confirmed the ability of tacrolimus to inhibit the T-cell response when started on day -1 in the AMR model. In this study, recipient rats either received, or did not receive, tacrolimus treatment starting on day -1 and were killed on day 3 after transplant, although the recipients retained 1 native kidney. Without tacrolimus treatment, grafts had a heavy T-cell infiltrate, as shown by immunostaining and CD3ε mRNA levels (Figure 7, a and c) and T-cell activation shown by marked increases in mRNA levels for IL-2, granzyme B, and IL-17A (Figure 7, d-f). Tacrolimus significantly reduced, but did not abrogate, T-cell infiltration into the allograft (Figure 7, b and c); however, this treatment did effectively suppress T-cell activation based on IL-2 and IL-17A mRNA levels, while the remaining increase in granzyme B mRNA levels may be due to production by NK cells (Figure 7, d-f). We have developed a model encompassing biochemical and histologic features similar to those of acute AMR in the sensitized patient. Preexisting DSA caused acute allograft rejection after kidney transplant but did not result in hyperacute rejection, making this a viable model. The rapid development of allograft rejection in sensitized recipient rats exhibited all 3 Banff criteria for acute AMR,10 in terms of (1) histologic evidence of acute tissue injury, including microvascular inflammation (peritubular capillaritis), acute thrombotic microangiopathy, and acute tubular injury; (2) evidence of recent antibody interaction with the vascular endothelium, including endothelial IgG deposition, linear C4d staining of peritubular capillaries, and overt endothelial cell damage; and (3) serologic evidence of DSA, including high serum levels of DSA shown by flow cytometry. The development of acute AMR in this model was accompanied by macrophage infiltration and patchy infiltrates of neutrophils and NK cells. One limitation of this model is that it focuses on the early stages of acute rejection caused by preexisting DSA. Further studies are warranted to develop a model of de novo DSA generation in the established transplant. In conclusion, we have developed a clinically relevant model of AMR with the biochemical and histologic features of AMR consistent with the human condition. The model results in high levels of DSA mimicking the highly sensitized potential transplant recipient and results in AMR without significant cellular rejection. This model will be useful in investigating mechanisms of acute antibody-mediated allograft damage and in testing new therapies to block AMR in the sensitized recipient. Nankivell BJ, Alexander SI. Rejection of the kidney allograft. New Engl J Med. 2010;363(15):1451-1462. Krisl JC, Alloway RR, Shield AR, et al. Acute rejection clinically defined phenotypes correlate with long-term renal allograft survival. Transplantation. 2015;99(10):2167-2173. Redfield RR, Ellis TM, Zhong W, et al. Current outcomes of chronic active antibody mediated rejection - A large single center retrospective review using the updated BANFF 2013 criteria. Human Immunol. 2016;77(4):346-352. Wasowska BA. Mechanisms involved in antibody- and complement-mediated allograft rejection. Immunol Res. 2010;47(1-3):25-44. Brown FG, Nikolic-Paterson DJ, Metz C, Bucala R, Atkins RC, Lan HY. Up-regulation of macrophage migration inhibitory factor in acute renal allograft rejection in the rat. Clin Exp Immunol. 1999;118(2):329-336. Kerr PG, Nikolic-Paterson DJ, Lan HY, Tesch G, Rainone S, Atkins RC. Deoxyspergualin suppresses local macrophage proliferation in rat renal allograft rejection. Transplantation. 1994;58(5):596-601. Tillou X, Howden BO, Kanellis J, Nikolic-Paterson DJ, Ma FY. Methods in renal research: Kidney transplantation in the rat. Nephrology (Carlton). 2016;21(6):451-456. Lan HY, Mu W, Nikolic-Paterson DJ, Atkins RC. A novel, simple, reliable, and sensitive method for multiple immunoenzyme staining: use of microwave oven heating to block antibody crossreactivity and retrieve antigens. J Histochem Cytochem. 1995;43(1):97-102. Ma FY, Woodman N, Mulley WR, Kanellis J, Nikolic-Paterson DJ. Macrophages contribute to cellular but not humoral mechanisms of acute rejection in rat renal allografts. Transplantation. 2013;96(11):949-957. Haas M, Sis B, Racusen LC, et al. Banff 2013 meeting report: inclusion of c4d-negative antibody-mediated rejection and antibody-associated arterial lesions. Am J Transplant. 2014;14(2):272-283. Jindra PT, Hsueh A, Hong L, et al. Anti-MHC class I antibody activation of proliferation and survival signaling in murine cardiac allografts. J Immunol. 2008;180(4):2214-2224. Wasowska BA, Qian Z, Cangello DL, et al. Passive transfer of alloantibodies restores acute cardiac rejection in IgKO mice. Transplantation. 2001;71(6):727-736. Gueler F, Rong S, Gwinner W, et al. Complement 5a receptor inhibition improves renal allograft survival. J Am Soc Nephrol. 2008;19(12):2302-2312. Wang H, Jiang J, Liu W, et al. Prevention of acute vascular rejection by a functionally blocking anti-C5 monoclonal antibody combined with cyclosporine. Transplantation. 2005;79(9):1121-1127. Joosten SA, van Ham V, Borrias MC, van Kooten C, Paul LC. Antibodies against mesangial cells in a rat model of chronic renal allograft rejection. Nephrol Dial Transplant. 2005;20(4):692-698. Rother RP, Arp J, Jiang J, et al. C5 blockade with conventional immunosuppression induces long-term graft survival in presensitized recipients. Am J Transplant. 2008;8(6):1129-1142. Li CJ, Li L. Tacrolimus in preventing transplant rejection in Chinese patients--optimizing use. Drug Des Devel Ther. 2015;9:473-485. Yano I. Pharmacodynamic monitoring of calcineurin phosphatase activity in transplant patients treated with calcineurin inhibitors. Drug Metab Pharmacokinet. 2008;23(3):150-157. Kalthoff FS, Winiski A, Fichtinger P, et al. 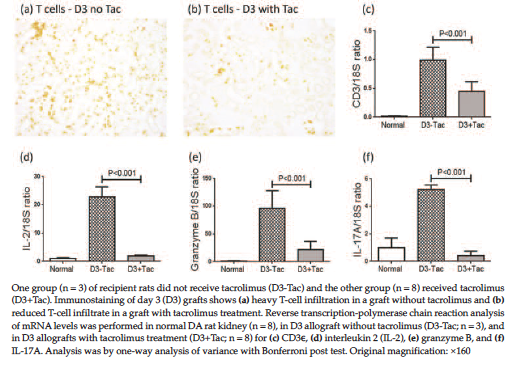 Differential inhibition of primary versus preactivated T cells by pimecrolimus but not by tacrolimus in vitro. Int Arch Allergy Immunol. 2007;142(3):255-264. Roelen DL, van Bree FP, Schanz U, van Rood JJ, Claas FH. Differential inhibition of primed alloreactive CTLs in vitro by clinically used concentrations of cyclosporine and FK506. Transplantation. 1993;56(1):190-195. Acknowledgements: This study was funded by a National Health and Medical Research Council of Australia Project Grant (to DN-P, FM) and an Australian Postgraduate Scholarship (to SRC). The authors have no conflicts of interest to declare. The authors thank Dr. Brian Howden for performing the rat kidney transplant surgeries and Naomi Woodman for technical assistance with flow cytometry. David J. Nikolic-Paterson and Frank Y. Ma contributed equally to this study.